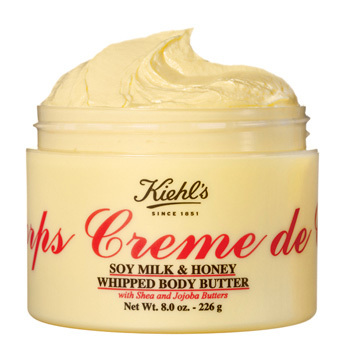 Deliciously whipped and decadent like a scoop of vanilla ice cream, Kiehl’s Creme de Corps Soy Milk & Honey Whipped Body Butter is as buttery as they come. Truly a luxuriously scented cream, it is light on skin yet rich in 24-hour hydration. Decadently air-whipped for instant penetration to restore, protect, and soften skin, its formula is quickly absorbed leaving behind an addictive scent. Jojoba Oil is extracted from the beanlike seeds of the desert shrub Simondsia Chinensis and has been traditionally used by both Mexicans and Native Americans for skin care purpose. It reduces transepidermal water loss without completely blocking the transportation of water vapor and gasses, providing suppleness and softness. It is nurturing for the skin and helps to restore skin’s natural lipid barrier. The formula contains NO parabens, glycols or silicones. Following Kiehl’s tips to apply on damp skin to seal in moisture, I started using the Body Butter immediately after a shower or bath, on slightly damp skin. Being whipped, the product does not require emulsifying; simply dip into the jar and apply. It leaves behind a slightly moist finish that absorbs slowly into skin, with a hint of its delicious, soft, warm luxurious scent. Unlike some other body butters that feel great immediately but only sit on top of skin, leaving you feeling dry within hours, this body butter actually absorbs and leaves your skin hydrated, even the next day. And I truly don’t know how Kiehl’s does it, but their softly scented products are intoxicating! For more information or to purchase, please visit Kiehl’s online for Canada or USA, or anywhere that Kiehl’s is sold! After reading the press release for the new OSiS+ products Blow & Go, I knew I had to take them for a spin. I will try anything to reduce blowdry time of my long hair!! Especially this time of year when I often wash my hair daily (I know, so bad for your hair). There are two blow-dry sprays for the perfect blow-dry: OSiS+ Blow & Go THICK provides hair with great volume and a glamorous shine, while OSiS+ Blow & Go SMOOTH provides sleek and luxurious smoothness. Both products come in a clear 200 ml spray bottle, misting a perfect, even spray. This may not sound like an important factor, but I always test sprays before buying a hair product – I’ve purchased too many with weak or faulty spray tops. OSiS+ Blow & Go is easy to use: spray onto damp hair, blowdry and style as required. Not a lot of product is needed. The only negative for me at this stage was that the product has a bit of an alcohol/hair spray scent to it when you first apply it; however, the scent does dissipate once you blowdry, leaving behind a very faint hair product scent. OSiS+ Blow & Go THICK makes your hair feel thicker, denser as you blowdry, and leaves behind visible volume. Who doesn’t love more volume! It also smoothes your hair with a touch of hold, eliminating the need for finishing products. 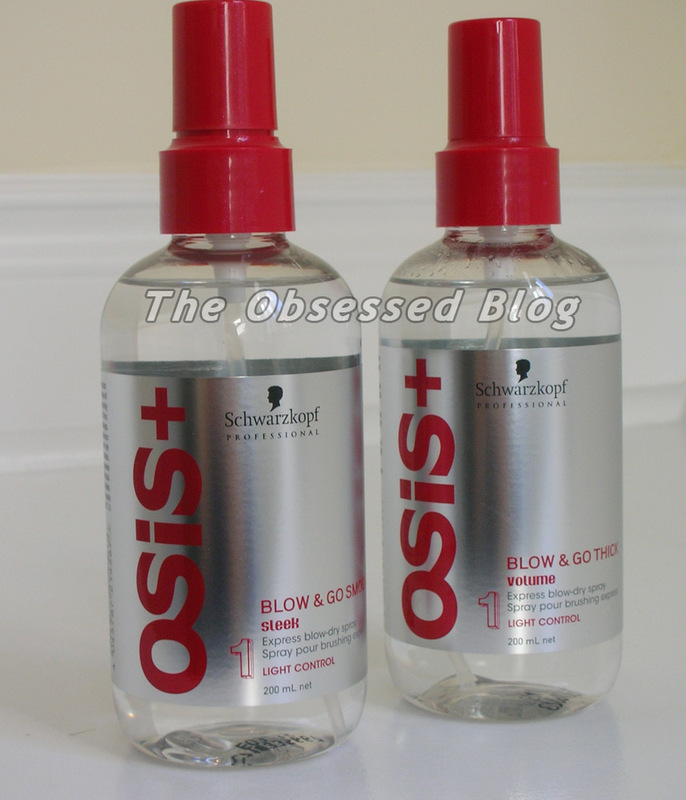 OSiS+ Blow & Go SMOOTH is very similar to THICK, minus the volume. Once you have blowdried, it feels more as though you quickly ran a hair straightener through your mane; it leaves behind a smooth, shiny, sleek finish, and helps eliminate frizz. Overall verdict? Both OSiS+ Blow & Go sprays seemed to help reduce dry time a little, and I loved the finished feeling of my hair. I did not think that they would be very different, but as mentioned, they do provide a slight variation in finish. I personally prefer the volume THICK provides, but have loved how SMOOTH helped provide some control on high-humidity days. OSiS+ Blow & Go is now available in Schwarzkopf Professional partner salons across Canada, for $21.00 Cdn/bottle. For further information please visit www.schwarzkopf-professional.com or www.press.henkel.com or visit the Facebook fan page! The Time is Pow! is a bright orange neon jelly, and is probably the brightest-looking out of the four in the bottle. I love a beautiful orange in the summer and this is no exception! The consistency was similar to Pink Outside the Box: jelly, smooth application. I applied two coats over white, but this time I left my index finger with just clear base – no white – to give you an idea of what it’s like alone. Even with the slight streaking you see, I think I will give Yellow It another try. The shine and that colour are just too gorgeous! Overall, I absolutely loved this mini set. A perfect collection, released at the perfect time. I felt the summer heat just applying these beauties! The consistency overall was great, and loving jellies as much as I do, I would love to wear these differently. The only negative? I wish they were full-size bottles! So which of the Neon Revolution minis is your favourite? This limited-edition collection will be available in July wherever OPI is sold, including Nail Polish Canada, though I have heard that this set has already been spotted in stores! 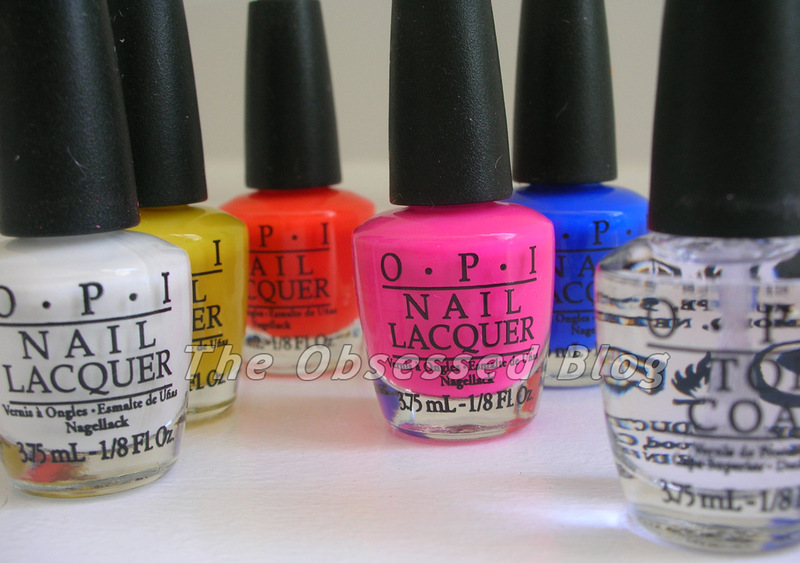 For more information, visit OPI.com, follow them on Twitter, and become a Facebook fan.